As the warmer weather is settling in, my socks are gone and I’m planning our summer activities. This means I’m booking camping sites and getting EXCITED!! Some of our fondest family memories take place while we’re camping. We get away from it all and take time to bond with one another over fishing, hiking and campfire food. Being out there in the fresh air certainly builds up an appetite and if there’s one thing we insist upon while camping, it’s good food. We don’t hold back, we cook as well as we do at home if not better. Today I’m sharing one of our family’s favourite breakfast recipes for camping. One of the most important meals we plan for are breakfasts. This is what fuels us for our daily activities and starts our days well. The secret to a delicious, nutritious breakfast while camping is preparation. Generally speaking, I prep most of our meals in advance and have wee baggies of ingredients ready for each one. 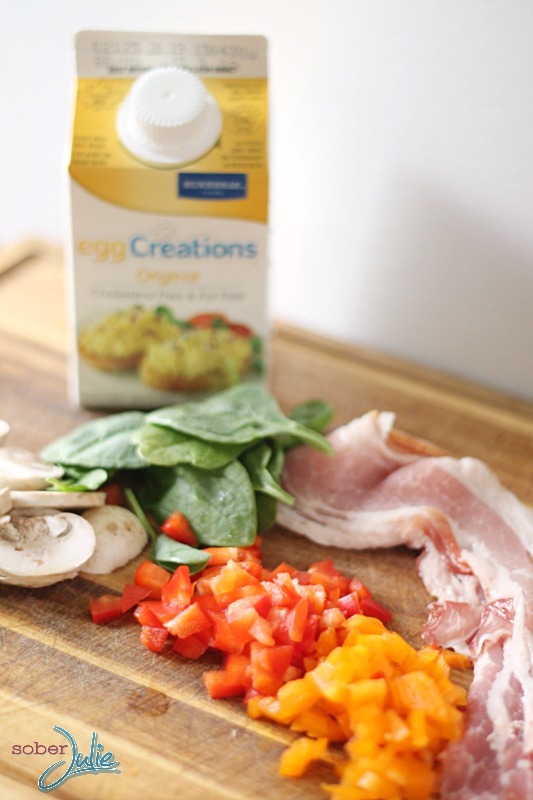 For this recipe I cut up some yellow peppers, chopped baby spinach, red peppers, mushrooms, spinach and has Burnbrae Farms Egg Creations original on hand. If you wanted to, you could freeze the Egg Creations and use it to keep your cooler foods cold on the way to your campsite! They thaw out just fine. Just a 1/4 cup is equal to one shelled egg and the carton makes it much easier to transport. Begin by heating your BBQ to 350 degrees F. Then spray the bottom of your muffin pan with non-stick cooking spray (or coat with butter/oil). Line each muffin cup with a piece of bacon…YUM. Put your omlette ingredients into each cup. 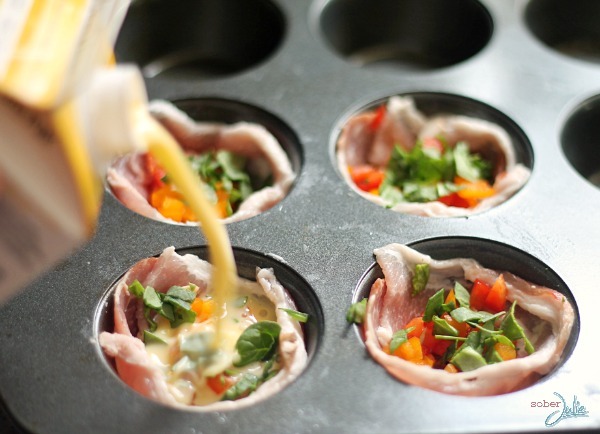 Add Egg Creations into each muffin cup, fill about 3/4 full. Pop it into the BBQ for 20 minutes or until the egg has set. Run a knife around the sides of each cup and lift out with a spoon. That’s it! Honestly, this just couldn’t be easier. 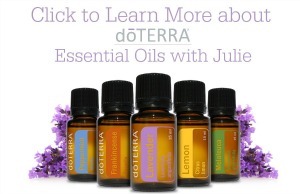 Each person can choose their own ingredients and it’s always a breeze! If you’d like your bacon crispy, rim each muffin cup with bacon and place the pan into the oven for 7 mins or until the bacon is not-quite crispy. Then add the rest of the ingredients and cook as outlined above. If you’d like to cook it on the fire, go for it! Just make sure the fire isn’t directly on the bottom of the muffin pan, cover it with tin foil and keep an eye on it as it cooks. I want to try all of these! They look so good and I love “compartment” cooking! That Bacon Wrapped Omelette is making me drool, Lol! Thanks for sharing such delicious, and nutritious easy to cook camping accessible recipes. Campers we are and these look perfect! 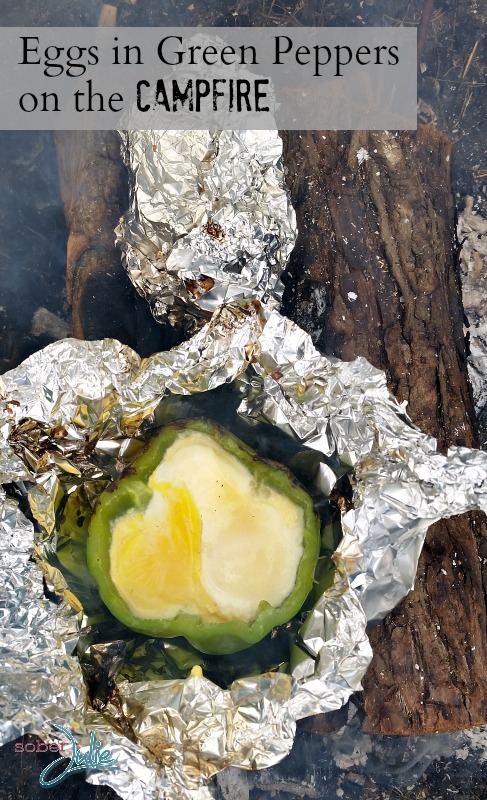 Im going to try my hand at the green pepper and egg next time i go camping. 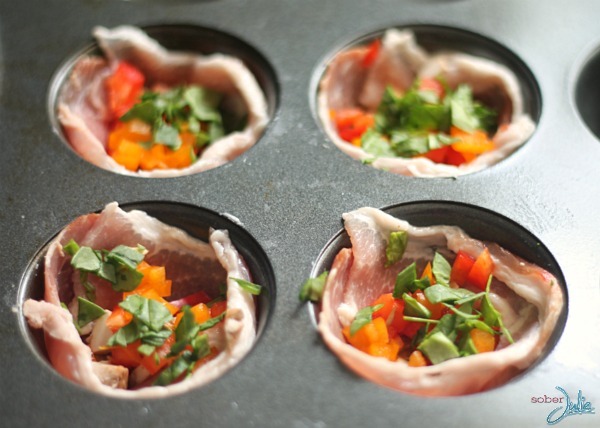 Love the muffin tin idea and who doesn’t love bacon! That’s quite creative. I love that you don’t need cups or anything to hold them, the bacon does it for us. I’m going to try experimenting with a few different ingredients. These look so yummy. The perfect Saturday morning breakfast. 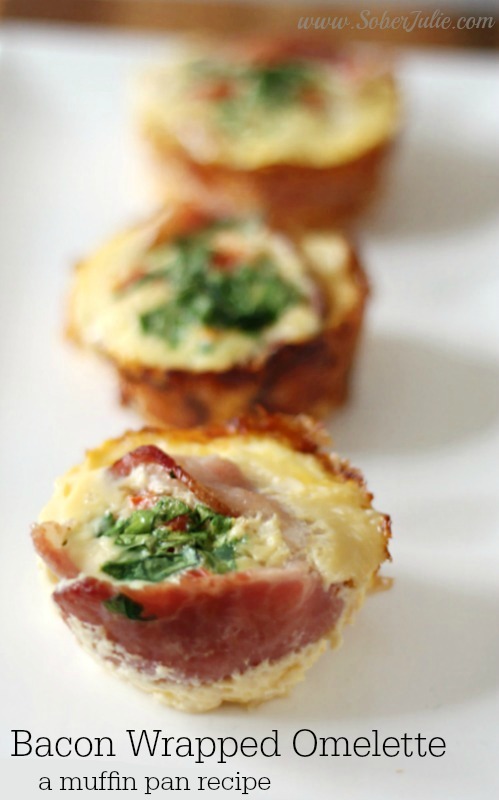 The Bacon Wrapped Omelette looks so good, going to have to try them out!! These would be perfect for the kiddos on the way to hockey practice! These recipes and not only yummy but ideal for camping too. Wow – looks delicious! My family are all big fans of eggs – I’m sure they’d love this recipe! These would be perfect to make ahead for a brunch get together, and much less messy for the eater! Cool idea for the houseboat trip we’ll make in August in Northern Ontario! a keeper! Genius idea! Looks awesome and love your blog. I’m in recovery, too! 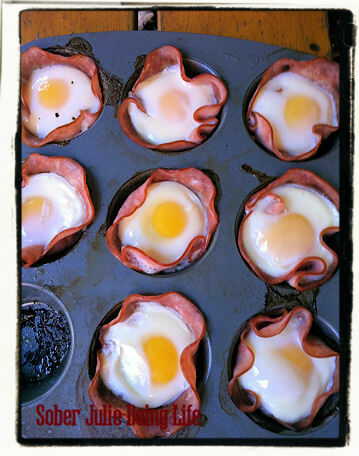 and can’t wait to try them.I am going to try the muffin bacon and eggs first. I love muffin pan recipes. These look great! 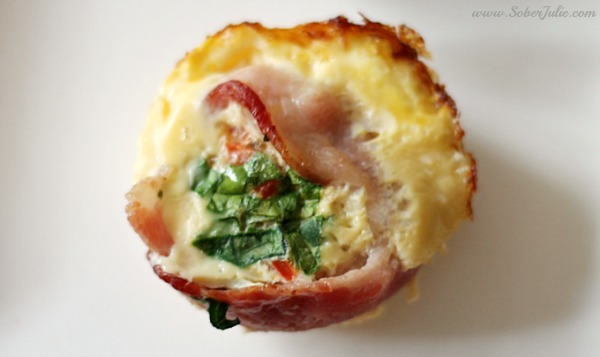 Your Bacon Wrapped Omelette muffins look really scrumptious! Love this easy to customize recipe, my family will love them, thx! Wow, this looks delicious. It has all my favorite ingredients in it, I’m going to be giving it a try very soon.